Weaving animation, live action, and testimonials The Green Wave is a powerful, touching documentary illustrating the dramatic events of the presidential elections of June 2009. Facebook reports, Twitter messages, Internet videos posts, and hundreds of real blog entries are included in the film as reference for the experiences and thoughts of two young students. The presidential elections were supposed to bring about a change, but contrary to all expectations the ultra-conservative populist Mahmoud Ahmadinejad was confirmed in office. As clear as was the result, as loud and justified were the accusations of vote-rigging. Protest demonstrations were broken up with brutal attacks by government militia, with excessive violence, arrests, kidnapping and some of them disappearing without trace. 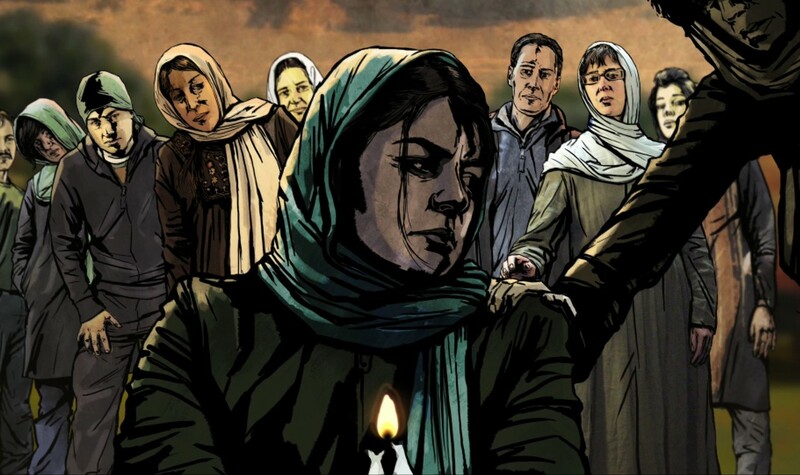 These fictional ‘storylines’ have been animated as a motion comic framing the deeply affecting pictures of the revolution and the interviews with prominent human rights campaigners and exiled Iranians. Ali Samadi Ahadi’s documentary is a highly contemporary chronicle of the Green Revolution and a memorial for all of those who believed in more freedom and lost their lives for it. "The Green Wave is an incredible portrait of a modern day rebellion and feels more urgent than ever in these ever-changing times"
"An anguished cry of despair and fury."